Paying by Credit Card click on the PayPal Check Box, provides option to pay by Credit Card. 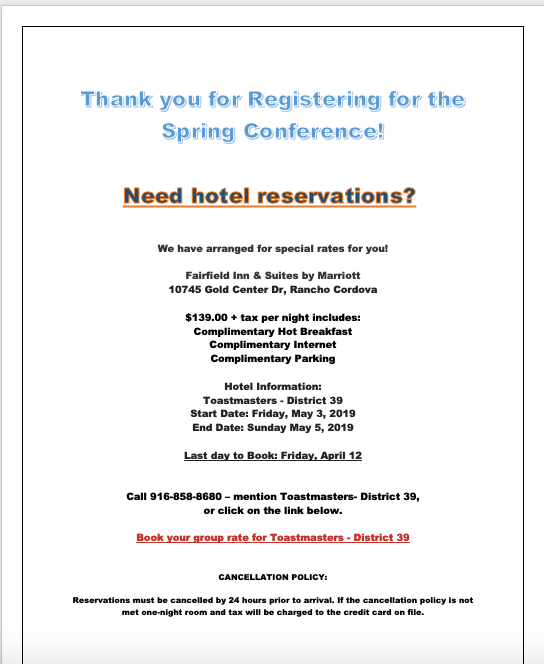 Fairfield Inn and Suites Rancho Cordova 10745 Gold Center Drive, Rancho Cordova, CA 95670 Room Rate for May 3 and May 4, 2019: $139 +tax per night. RESERVATIONS METHOD: Individual Reservation must be made online or call the property direct at 916-858-8680 and mention the group name “Toastmasters- District 39“. Reservations must be made by 4/12/19. GUARANTEE & BILLING: Guarantee Method: Guests will need to provide a credit card upon making individual reservations to guarantee their rooms when making reservations.Parking: All parking is complimentary for all overnight paying guests. CANCELLATION POLICY: Reservations must be cancelled by 24 hours prior to arrival. If the cancellation policy is not met one night room and tax will be charged to the credit card on file. , no later than April 15, 2019. Celebrate your clubs diversity and create a basket for the annual raffle. Buy your tickets online.